I know, I know, I’m the last one to try and pull this off. But after this week’s rant against the casual corporate world, I am determined to try and offer alternatives to the all-too-prevalent untaliored Dockers® and golf shirt/untucked shirt and $100 jeans look favoured in the workplace. This is made even more difficult as it is beginning to be uncomfortably warm — in spring, winter and fall I have a fighting chance layering for effect and using luxury fabrics like leather and cashmere. This is my first attempt. Above you will see a riff on the flat front/polo shirt look. I’m wearing flat front, cuffed, slate coloured wool trousers (in a lightweight super 120’s fabric), a black belt, silk heavy ribbed tennis collar shirt and chiseled toe venetian loafers (with socks.) I would prefer a sportcoat and a neckerchief, but I’m trying to be as mainstream as I can without sacrificing the smart part of smart casual. You can see the problem with flat front trousers — they crease a lot when you stay seated for any length of time. I also have trouble hiding the phone, money clip, card case, pocketknife and handkerchief that are usually kept in my pockets. Since wearing anything at my waist other than a belt is out of the question, this look requires that I carry a bag. In cooler weather I could wear a car coat, safari jacket or other light jacket and take advantage of the extra pockets that that affords. This entry was posted in Elegantology and tagged casual clothing, dressing, Elegantology. Bookmark the permalink. Nice job! Where I work (NYC IB) polos are “frowned upon” outside of the IT department — my daily “casual wear” (isn’t “business appropriate” prefereable?) is a french cuff from Pink/Turnbull or similar, wool trousers (flat front with cuffs –your comments re. pleats has gotten my re-thinking my aversion to same), and gucci or BB loafers. Regularly paired with a navy blazer or odd jacket (most useful for manly “stuff”). Haven’t braved a pocket linen yet, but thinking about it! On another note, just bought my first ascot (not for office, ever) and liked it so much went back for more. Has been perfect on a slightly cool weekend afternoon, and a bit of a conversation piece I might add, ranging from outright hilarity (“Hey Thurston!”) to admiration. Keep up the good work, you are an inspiration! I think that the issue with silk and some of the other fabrics is that they tend to stick to you in the warm (!) Richmond summers. the rule of the collared shirt still rules round here. I also love a band collar linen or cotton shirt. Flat front pants are chic but do pose a pocket issue when laden with cell phone/ blackberry, wallet and keys. Hello Fairfax, and right you are. Although Gold Bond Cooling Body Powder helps a bit. When it gets really warm, I’m often in linen shirts or cotton open weaves. Mrs. PvE, there is that rule isn’t there? I have a cashmere t-shirt that I bought ot wear under summer jackets, but can’t bring myself to do it. Vestiges of school, I guess. I like the notion of dressing up the polo & khakis combination. However, the problem I have with pulling off the polo + wool pants look is the texture mismatch. I associate the texture of a nice pique polo with a fresh, clean, summery, slightly preppy look, and pique polos go naturally with cotton pants. Similarly, fine-gauge mercerized cotton or silk polos have more of a sleek downtown feel that I don’t favour as much, but are a better match for wool trousers. 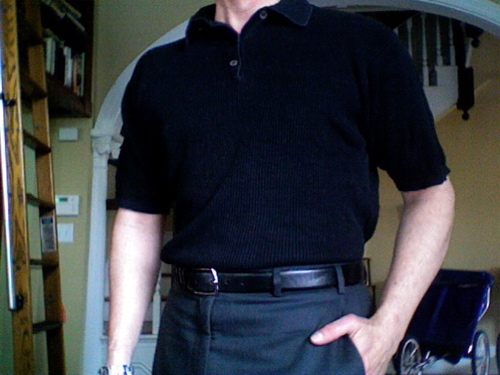 I think my negative associations for the “sleek” polo come from seeing a certain type of man, usually well-off and about 50, whose summer uniform is a black mercerized polo, tan wool trousers, black loafers and prominent gold watch – generally a salesman of some sort. Probably a good fellow at heart, but not the type of look I want to project with my summer wardrobe. Hello Hal, I understand your reluctance, but urge you to reconsider as the wool trousers I refer to are the new(er) very lightweight super 120’s (+). they are actually cooler to wear than cotton as they let the breezes through. That having been said, the flat front chinos and polo shirt/loafers combination can look very Dean Martin in the right cuts.